Putting it Together is my Monday “artist talking about art stuff blog”. 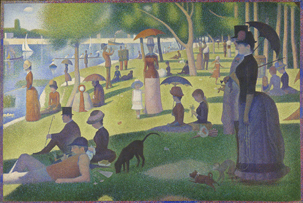 The title comes from “Sunday in the Park with George,” the best (and possibly only) musical that is entirely dedicated to an artist talking about his art. Is that pretentious enough? As an independent producer, I understand that I’m not going to succeed unless I convince other people what I’m doing has some merit. This means I have to engage in the process of self promotion. I’m not very good at self promotion. I just imagine that people get sick to death of hearing about what Tim is up to these days. Most of the time I do what I think is the barest minimum amount of promotion for my work. I put up a Facebook post about it. I tweet about it. I…tweet about it again. I do the easy things. The things that take a few minutes or seconds to do and then I hope that it’ll be enough. If I do too much, I reason, people are just going to tune it out. When my friends ask what’s going on, I rarely tell them that I have a show coming up because I assume they already know. I mean I tweeted about it twice, right? Besides, my shows do fairly well. I’ve not failed by any means. On the other hand, some shows (like Big Fun Radio Funtime) have not found a broad audience. That means I’m clearly not selling the show the way it needs to be sold. Failure to talk about what I’m doing can easily be misconstrued as a lack of excitement and if I’m not excited about what I’m doing, how can I convince anyone else to be excited? But I’m about to try to make a living doing this sort of thing. You can’t make a living at anything if you aren’t willing to sell what you can do. It’s all well and good to make something but building a better mousetrap doesn’t do you any good if nobody knows it exists. Which means part of the process of becoming a full-time creative is figuring out how to creatively let the world know I’m doing stuff that is interesting. And I can’t be so self-conscious about it. I have to remind myself that I like to learn about what other people are doing. It never bothers me to listen to someone tell me about a new show they are creating. At most, I’ll be upset that I didn’t think of it first. If I don’t mind hearing about other people’s’ projects, why am I so concerned about telling them about mine? If you are going to self produce, you have got to believe in what you are producing. If you can’t sell that product, no amount of work you put into improving the product will do any good. People won’t come and see your stuff just because you are good. A few will. Your family and your good friends will. They might even tell you that you are great and that might be the ego boost you need to keep going. If you want to play music or produce shows or paint as a hobby, that will probably be good enough. If you want to do it as a living, though, you have to get other people excited. More than excited. You have to get them engaged. And so the point: that is what this blog is all about. It is about sharing and talking about the creative process. It is about getting better at self promotion. It is about generating excitement and, I hope, conversation. So in the interests of self promotion, I’m going to point out that I spend a lot of time trying to be funny on Facebook and on Twitter. You could follow me. You can follow this blog, too. I’ll do my best to make the experience an interesting one. Next week, I’m going to write about doubt! Excellent timing on this. I’m having the same issues with my writing … exactly the same. I look forward to your ongoing reports on this. The underlying fear is always rejection. If you claim you’re really just doing this for yourself, that doesn’t matter – no rejection. What if you entice many people to a show and they hate it? Oy! You have taken a big step and I applaud and support you for that.